The San Diego Aces Disc Golf Club and Team Rizbee Productions are proud to present the 2010 Montiel Ice Bowl!! 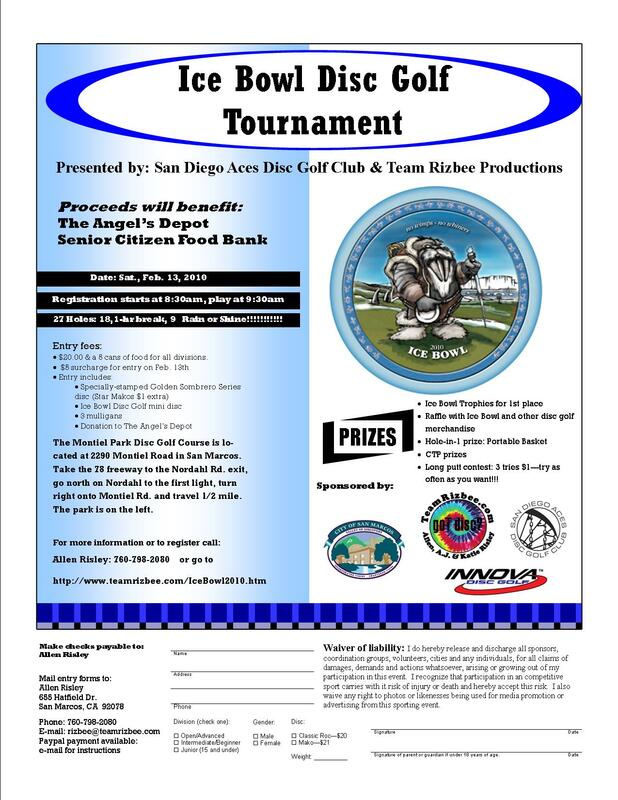 Once again this tournament is being held to benefit The Angel's Depot, a senior-citizen food bank here in North County San Diego. The Montiel Ice Bowl is also one of the 5 stops on the Golden Sombrero Tour, a collection of five Ice Bowls (San Marcos, Redlands, Salt Creek, Palm Desert and Chavez Ridge) all working towards charitable causes. A Golden-Sombrero stamped tournament disc, either the Star Classic Roc or Star Mako (Makos $2 extra). As with other Team Rizbee events, there will be other fun stuff, including CTP prizes, the return of Disc Golf Bingo and Disc Golf Trivia. There will be a long-putt contest to win a 2010 Ice Bowl hoodie - one dollar for three shots. Spots will be limited to the first 54 players, so sign up soon. Click on the entry form below to download the entry form pdf file. Registration list can be found here.